Candace H. Johnson-For Shaw Media Mikayla Scott, 13, of Gurnee and her brother, J.C., 7, look at a 1966 Mustang during the Car Show for Gurnee Days at Viking Park in Gurnee. The Mustang was owned by John Scott, of Gurnee. 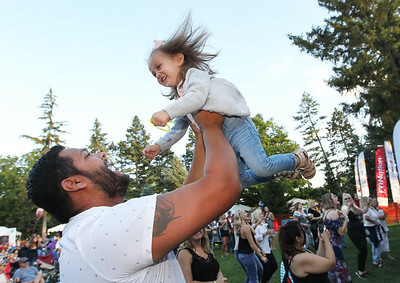 Candace H. Johnson-For Shaw Media Sid Estrada, of Gurnee has fun with his daughter, Paisley, 2, while they listen to a GooRoos concert at the Band Shell during Gurnee Days at Viking Park in Gurnee. 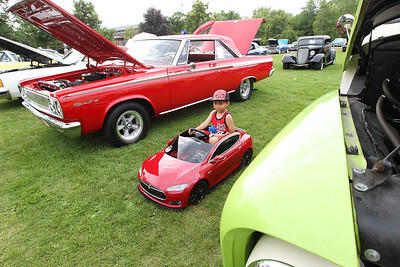 Candace H. Johnson-For Shaw Media Carter LaBrado, 6, of Gurnee drives a mini Tesla past a Dodge Coronet during the Car Show for Gurnee Days at Viking Park in Gurnee. 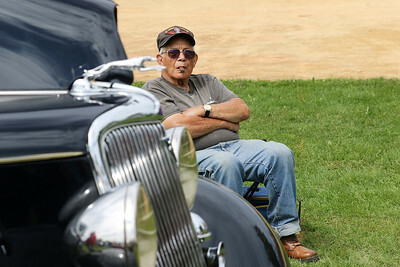 Candace H. Johnson-For Shaw Media Joe Gentile, of Mundelein sits next to his 1934 Ford during the Car Show for Gurnee Days at Viking Park in Gurnee. 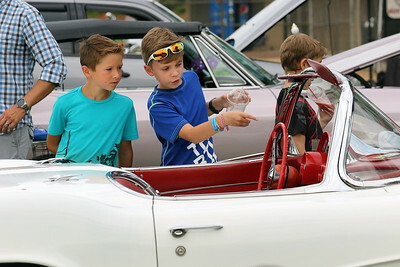 Candace H. Johnson-For Shaw Media Owen Lehner, 8, and Wesley LaRue, 9, both of Gurnee check out a 1962 Corvette during the Car Show for Gurnee Days at Viking Park in Gurnee. 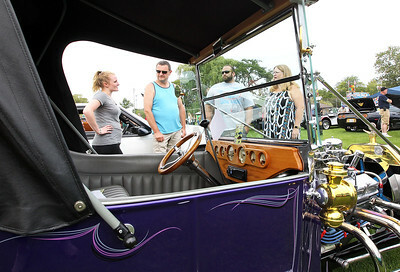 Candace H. Johnson-For Shaw Media Brittany Troemel, of Lake Bluff, Glen Shaw, Scott Kuffel and Julie Shaw, all of Gurnee stand next to a 1917 Ford T Bucket Roadster during the Car Show for Gurnee Days at Viking Park in Gurnee. The car was owned by Jack Fallos with McClure's Garage in Gurnee. 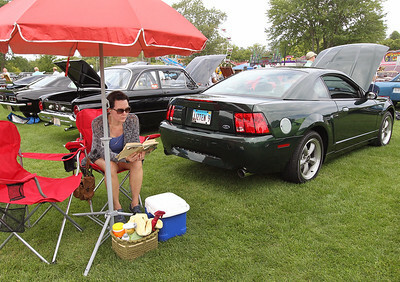 Candace H. Johnson-For Shaw Media Tina Meadors, of Libertyville sits next to her husband, Keith's, 2001 Mustang Bullitt as she reads a book called, "The House," written by her great aunt, June Moore Ferrell, during the Car Show for Gurnee Days at Viking Park in Gurnee. 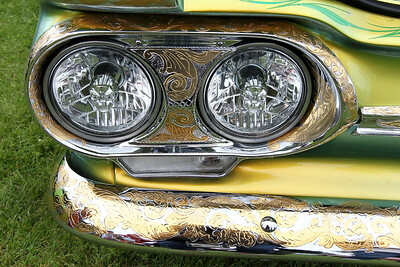 Candace H. Johnson-For Shaw Media Engraved headlights of a 1963 Chevrolet Corvair created by Brian Hughes, of Antioch were on display during the Car Show for Gurnee Days at Viking Park in Gurnee. Hughes engraved the entire car, top to bottom. 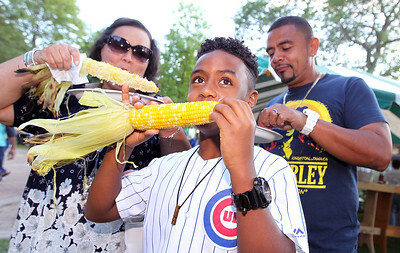 Candace H. Johnson-For Shaw Media Rowena Estell, of Waukegan, Justice Humphreys, 10, of Gurnee and his father, Leyvan, enjoy some corn from the Exchange Club of Gurnee's Ribfest during Gurnee Days at Viking Park in Gurnee. 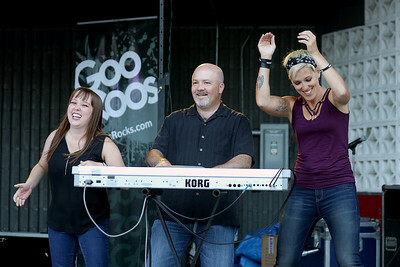 Candace H. Johnson-For Shaw Media Jeff Neuschaefer, of Arlington Heights, (center) keyboardist with the GooRoos band, gets some extra attention on stage from backup singers, Terri Kaszynski, of DesPlaines and Tesa Edwards, of Antioch as they perform at the Band Shell during Gurnee Days at Viking Park in Gurnee. Candace H. Johnson-For Shaw Media Haley Krizanovic, 20, her mother, Kelly, and grandmother, Nancy Buchta, all of Antioch dance while listening to the GooRoos band during Gurnee Days at Viking Park in Gurnee. 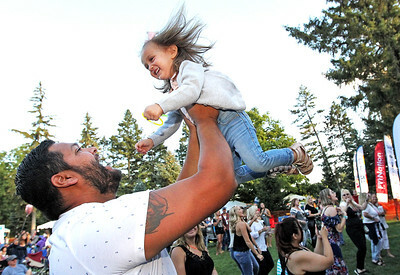 It was a family affair, the guitarist for the GooRoos, George Krizanovic, is Haley's father. 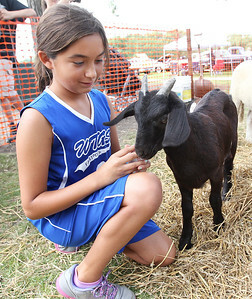 Candace H. Johnson-For Shaw Media Grace Rios, 10, of Gurnee visits with a goat from the Patch 22 petting zoo during Gurnee Days at Viking Park in Gurnee. 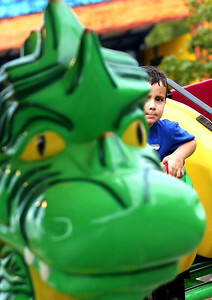 Candace H. Johnson-For Shaw Media Sam Lindgren, 4, of Grayslake rides on a Dragon Wagon during Gurnee Days at Viking Park in Gurnee. 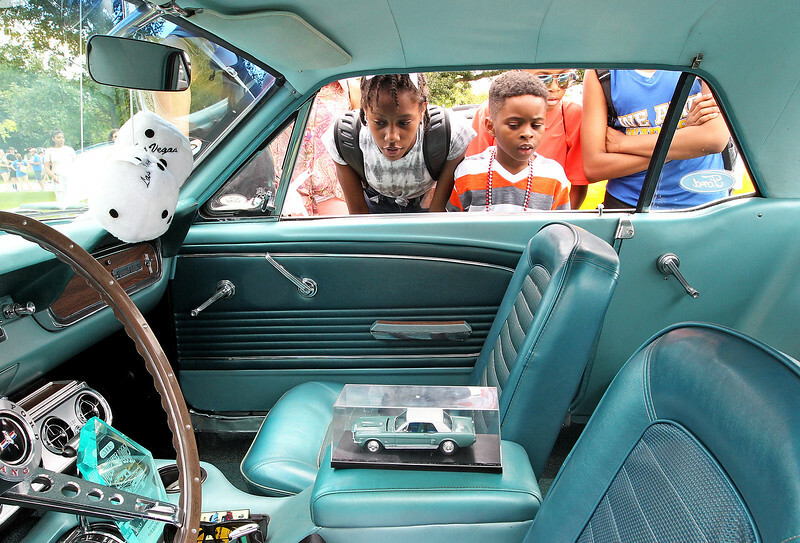 Mikayla Scott, 13, of Gurnee and her brother, J.C., 7, look at a 1966 Mustang during the Car Show for Gurnee Days at Viking Park in Gurnee. The Mustang was owned by John Scott, of Gurnee.